Hiram Young of Independence, Missouri manufactured freight wagons and equipment in the 1850s. Born about 1812 in Tennessee, he entered Missouri as a slave and worked for George Young of Greene County. 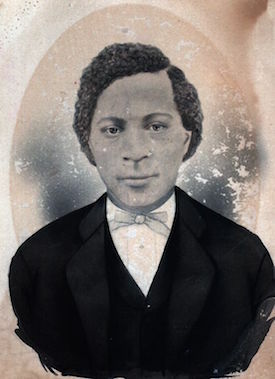 In 1847, Young obtained freedom, either from his owner or possibly as a result of an estate partition hearing at the request of George Young’s family. It is said that Young worked out his freedom price and that of his wife, Mathilda, by whittling and selling ox yokes. Young and his wife moved to Independence, Missouri about 1850. They had one daughter, Amanda Jane, who was born around 1849 or 1850. Taking advantage of his location near the beginning of the Oregon, Santa Fe, and other major overland trails in the 1850s, Young built wagons for western emigrants and for farmers in the area. He also made freighters for the U.S. government. Independence’s first mayor and Santa Fe merchant, William McCoy, served as his business manager. Until 1855, Young had a free black man as a business partner, Dan Smith. Smith left Independence due to increasing anti-free black sentiment in the area. The Young family, however, remained. As Civil War tensions mounted between pro-and anti-Union supporters along the Kansas-Missouri border, Young and his family fled to Fort Leavenworth, Kansas in 1861 where slavery was illegal. He continued his wagon business from Fort Leavenworth. After the war, the family returned to Independence. In 1866 they became the founding members of Saint Paul’s African Methodist Episcopal (AME) Church. Around the same time Young sued the United States government for $22,100.00 in war-related losses. Neither Young or his wife ever learned the resolution of the case. Hiram Young died in 1882 in Independence, Missouri and his wife, Mathilda, died in 1896. The Young lawsuit however continued until 1907, at which time the courts ruled against his descendants. William P. O'Brien, "Hiram Young: Pioneering Black Wagon Maker for the Santa Fe Trade” Gateway Heritage: The Quarterly Magazine of the Missouri Historical Society, Summer 1993; 56-67; "Hiram Young: Black Entrepreneur on the Santa Fe Trail." Wagon Tracks 4(1), Nov. 1989; Estate of Hiram Young, Deceased vs. The United States (No. 7320 Cong.) Affidavit of Hiram Young, November 1881; Young vs. United States: Depositions on the Part of the Claimant--Personal Testimonies, 1897: Record Book Y, 106, Jackson County Recorder's Office, Independence, Missouri; Hiram Young: #5124 RG Dunn Collection, Baker Library, Harvard University; Loren Schweninger, ed., From Tennessee Slave To Saint Louis Entrepreneur: The Autobiography of James Thomas (Columbia, University of Missouri Press, 1984).